For decades, Melbourne’s Southbank Promenade has been home to myriad restaurants and bars each trying to find its own distinct way to lure the throngs of tourists and locals through the door. 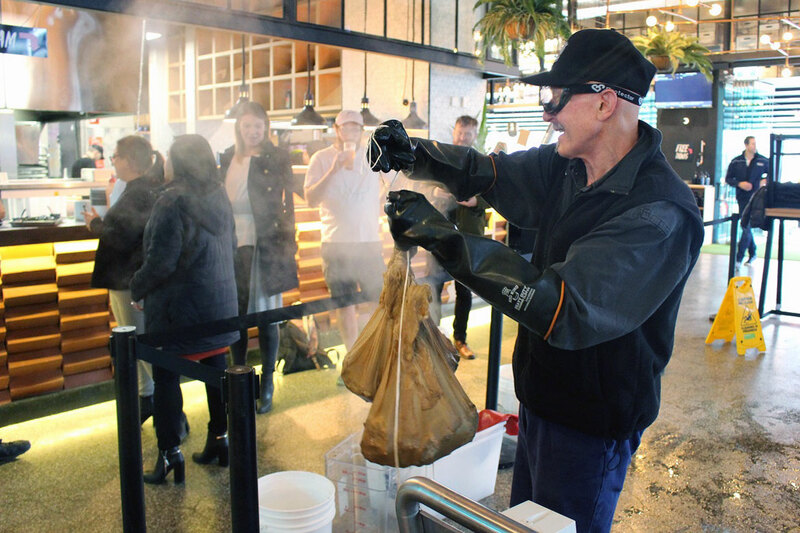 This week, Hopscotch unveiled one of the most novel approaches yet: ensuring the unmistakable aroma of beer being brewed wafted through its doors and over the Yarra. The former World Bar & Restaurant was reinvented as a multi-faceted operation last year with craft beer very much central to its offering; cast your eyes over its very many taps and among the mainstream lagers you'll find a dozen or more diverse beers from local, independent brewers. Yet the plan was always to offer more: to the left as you walk in is a small microbrewery that sits just metres from the kitchen and was fired up for the first time yesterday. Assistant venue manager Selena Majumdar says having such a system onsite, allowing them to pour beer straight from the bright tank for customers, is an exciting way to stand out. Designed to brew single 300-litre batches, the quirky, stacked Spark Breweries and Distilleries system would be one of the smallest used to brew commercially in the country. It's been given the moniker “Frank the Tank” by Hopscotch’s staff, with Frank intended as somewhere for local brewers to come in and brew one-off beers to be served at subsequent beergustation dinners. Former CUB man Mick Jontef puts on a show for Southbank visitors. 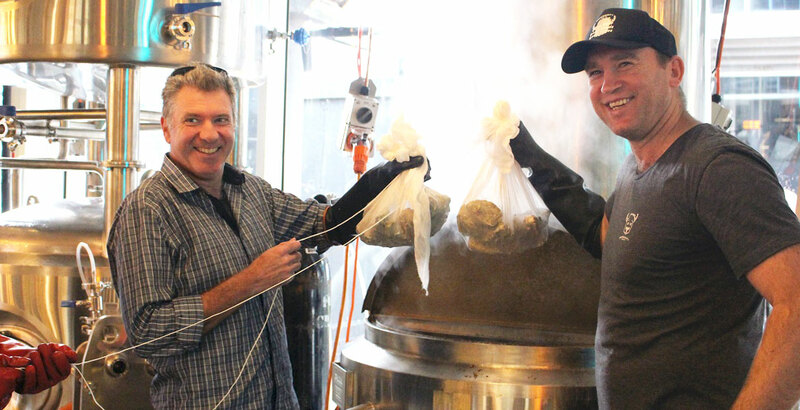 The first guest brewing company to put Frank through his paces was Brewmanity, the MND battling operation founded and headed by former Melbourne FC captain David "Neita" Neitz (pictured top right adding oysters to the brew with Brews News' Pete Mitcham). He was there for brew day, but the person tasked with overseeing brewing was Mick Jontef, one of the most experienced brewers in the country who spent most of his career at CUB before joining Brewmanity. 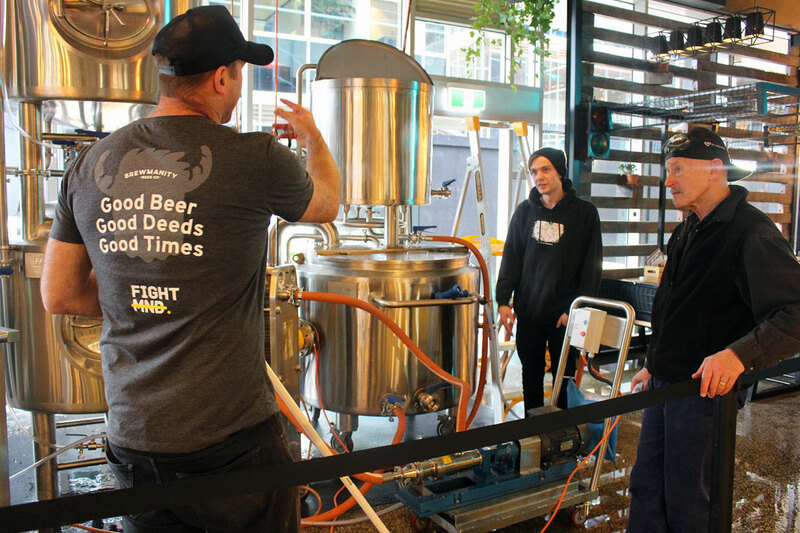 He says that, while the small system does take some getting used to – as does brewing on such a small floor space within a busy venue – he sees the worth of such setups for bars and brewpubs. Joining him was one of Hopscotch's staff members, learning the ropes to ensure there's someone in-house that knows Frank inside out to assist other brewers when they pay a visit in the future. Once a leader... Neita takes charge of the first brew day at Hopscotch. As for the beer bringing brewing to Southbank, the Brewmanity team opted for an oyster stout. Neita had wanted to brew a stout for some time, although throwing unshucked oysters in during the boil was Mick’s idea. Here's hoping his decades of experience ensure the final beer isn’t quite as murky as the river by which people will soon be enjoying it. Look out for details of the beer's launch in the Crafty Pint Calendar. About the author: Will Ziebell is a history graduate who finds the greatest use for his degree is telling anecdotes to anyone who will listen. Often they involve beer, especially when hosting Melbourne Brewery Tours. He can be found on Instagram and Twitter.